The proposal, consisted of implementing a compact building structured around four landscaped courtyards. The site confines with an archaeological protection. This nursery is the extension of the School Complex “Bartomeu Ordines” in Consell, Mallorca. The new building is composed of six classrooms (for children between 3 and 5 years old), one psychomotor classroom and a dining area including kitchen. This elegant contemporary house in the Balearic Islands is formed from a single-storey volume with a central focal two-storey element. 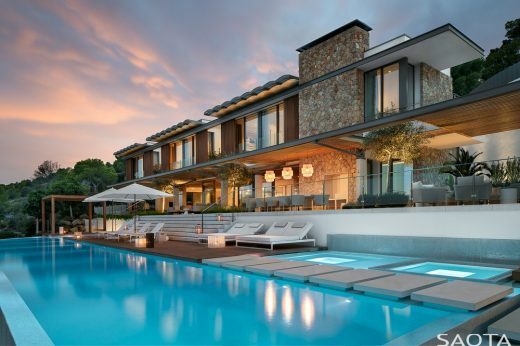 The simple white facades are softened by timber brise soleil, working with the blues of the sky and obligatory pool. The house is located at the back of the plot, facing south, maintaining the existing forest of pine and oak trees, and framing the mountain’s profile. The exterior of this Mallorca residence, made of sandstone, uniformly covers facades, sloping roofs and roadways so that it can be observed as a single piece. n 1967, a small hotel, Hotel Castell dels Hams, was established on the island of Majorca amid the Mediterranean vegetation. Over time, and through subtle improvements and extensions, it has become one of the most distinctive hotels on the eastern part of the island. The last of the alterations, meant to celebrate the Mediterranean light and the location’s idyllic bond with nature, turned the hotel into much more than just a holiday destination. The great natural entrance to the Caves of Hams in Mallorca houses a lush botanic garden. It is in this entrance that the bar is situated and made up of a piece of backlit glass of 10 metres in length. The counter of the bar, the most important element of the project, is fitted into a concrete cavity made up of straight lines, designed to contrast with the organic forms of the cave and can be closed under a transparent cover. The main facade is oriented to the west. A system of solar glass slats in various shades of green allows us to enjoy the views, protects us from radiation and simultaneously gives a clear and recognizable image of the building. The Ushuaïa Ibiza Beach Hotel welcomed the famous island’s season with a memorable opening party on the 26th of May – and participating dynamically in the celebrations was a new façade and design features made from DuPont™ Corian®. The high-tech solid surface was specified to revitalise several key areas of this popular young holiday venue. From the main façade to the club’s cocktails bars and through to the poolside décor, DuPont™ Corian® stylishly refreshes the hotel’s image by both day and night. Jørn Utzon moved to Majorca in the early 1970s, following the stress of the Sydney Opera House debacle, living in a house designed by himself. With his wife Lis & family he later moved to another house designed by himself, Can Feliz. The architecture is very solid and simple. A small window allows light to funnel in to the living space at a certain time of year and time of day. The views over the Mediterranean are fantastic and the exterior space uses beautiful chunky stone benches by the architect. This second home on Majorca has been described as a miniature acropolis.